The Southern wall of the Claii falls vertically from the Edge and the Tip of the Big Sea, in the extreme north of the Valley Treasures Claii, forming in the eastern zone an amphitheatre wide, bounded to the Vatea Prahova mane strong crooked tip All that Great. The amphitheatre is crossed in the lower part of two girths separated from each other by a strip rocky and high ; the first, called the Girdle-Thin, move on to the base of the amphitheater, and the second — the Girdle of the Above constitute the starting platform, on the tracks of this wall a remarkable alpine character. Add that, viewed as a whole, the landscape severe of the Wall Claii Large is mitigated, to a certain extent by the presence of these circus, in parts dotted with clumps of spruce and rich grass; they do not diminish but the technical value of the escaladelor taken on its conduct, the Wall Claii hovering, under this report, along with the great steeps of the Marigolds, Co?tilei, Eagles, and Valley White. Access route: Follow the Log Path to the Howlers; it drives after an hour in the "Bend". Here, after a series of switchbacks, the road continues horizontally, and after approx. 10 min to the corner of the posts get in the V. Treasures. Leaving the Road to the Howlers, we follow to the right tavelgul Valley Treasures, climbing directly or bypassing the obstacles on the way. 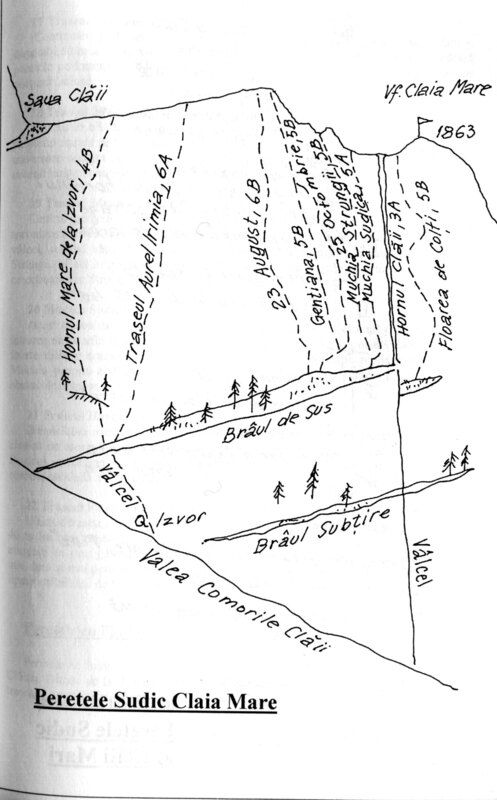 Soon, the valley of the confluence with the thread Comorlle Brânei, which descends from the left as we climb). Our route follows in the next thread on the right, called the Valley of Treasures Clali, on whose road climb to the small intervate three jumpers. Soon we reach the confluence with a small valley, which descends from the right (how to get) whose origin a distinguish at a distance of approx. 80 m above. Parasind the main thread, we follow this valley up for a distance of approx. 60 m, to the right of a gavan (located in left) in which a small spring is resfira waters over the flagstones of the wall. Here, to the right, climb slightly on hata?ul Waist Up, having left the wall, slit vertically from the Chimney of the Big Spring. Retreat route: Go on his Belt Mark up in Jepii Large or Jepii Small (left or right, as you prefer) and descend on the marking of the tourist up in the Logs.